Just a six minute walk from the heart of Vail this is a justly popular hotel choice. The facilities are good, the rooms are big and well equipped whilst the hotel has a friendly and lively ambience. 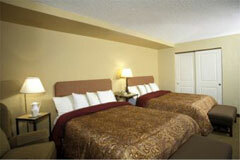 It is conveniently on the efficient free shuttle route either to the Vail or Lionshead ski lifts. Rooms are oversized with two queens or king and sofa bed and sleep up to four. Just a six minute walk from the heart of Vail, the Evergreen Lodge is conveniently on the efficient free shuttle route either to the Vail or Lionshead ski lifts. With a great snow record and Keystone, Breckenridge and Arapahoe Basin all being available on the same pass, skiing here is pretty good. The skiing in Vail itself is largely geared towards intermediates, but beginners also have plenty of nursery slopes and some brilliant ski schools. Advanced skiers will love the 'Back Bowls' for powder. Freestyle skiers and boarders are spoilt for choice with snowparks, half-pipes and their own maps detailing the best spots. Beaver Creek, linked to Vail by bus, provides for the more advanced skier, with some superb black runs. As with most North American resorts, the lifts and convenience are exceptional, with queues being a rarity. Vail itself is large, offering a wide range of restaurants, shops and nightlife. Vail also has plenty of off-snow activities, with the free bus making these very accessible. It can, however, be expensive, with prices increasing as you get closer to the lifts. There are a wide range of eateries, some of excellent value, as well as shops and nightlife to excite non-skiers. Denver, the nearest international airport is 2½ hours away. Warning: be wary of altitude sickness mixed with jet lag!